(L-R) New York City mayor Bill de Blasio is not a fan of Chase Utley. The bevy of New Yorkers upset by Chase Utley’s hard slide on Ruben Tejada in Saturday’s Game 2 of the NLDS has been joined by the city’s mayor, who offers some harsh words for the veteran infielder. 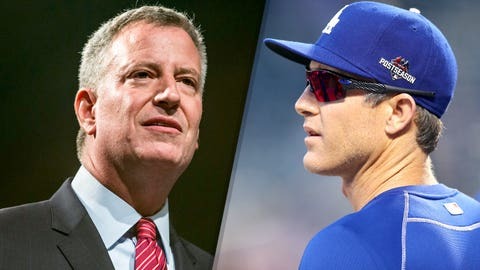 From the New York Daily news: "He can appeal all he wants, but he’s guilty as sin," New York City mayor Bill de Blasio said Monday of Utley appealing his two-game suspension for his slide on Tejada, which broke the shortstop’s leg. Since Utley’s appeal wasn’t processed on Monday, he can play in Monday’s Game 3, although he was not penciled into the starting lineup by Dodgers manager Don Mattingly. "I think the people of New York City will let him know how they feel," de Blasio said. "That’s unbelievable. He deserves all the boos he gets." As for the slide in question, which has drawn much controversy and debate since it occurred, de Blasio offered his candid thoughts. "It was a tackle; it was illegal; it was sickening," he said. de Blasio wasn’t the only New York politician to express his opinion on the matter, either. "I am glad that that great Brooklynite, Joe Torre, stepped up to the plate, and suspended Chase Utley for two games," Sen. Chuck Schumer said. "I would have suspended him for three games. Because I watched the game and I saw what he did."